Bus from KLIA to Sitiawan or bus from KLIA2 to Sitiawan is one of the highly sought-after bus services in both KLIA and KLIA2 airports. Many locals (from Sitiawan and Teluk Intan areas), as well as foreign tourists (planning to go Pangkor Island), would rather go straight to visit Sitiawan without passing through Kuala Lumpur city after landing at the airport. Hence bus from KLIA to Sitiawan or bus from KLIA2 to Sitiawan, provided by Star Shuttle, offers great convenience to locals from Sitiawan & Teluk Intan area, and foreign tourists. Star Shuttle is the only operator serving bus from KLIA/KLIA2 to Sitiawan. The same coach will drop off passengers when passing by Teluk Intan. There are in total 9 schedules daily for bus from KLIA/KLIA2 to Sitiawan, starting from 6:15 a.m. in the morning until 2:15 a.m. after midnight. After touching down and clearing customs, passengers can proceed to coach bay area in KLIA and KLIA2 for checking in and boarding. The travel duration for bus from KLIA to Sitiawan or bus from KLIA2 to Sitiawan is about 4-5 hours depending on traffic condition. The coach will travel directly from KLIA then to KLIA2, before heading to Teluk Intan, and will finally terminate at Sitiawan (Jalan Lumut). This direct service from KLIA/KLIA2 to Sitiawan is convenient because passengers can skip the process of shuttle transfer to Pudu Sentral and transit waiting time at Pudu Sentral. Besides that, by avoiding going into Kuala Lumpur city, it saves the passenger from the heavy traffic in Kuala Lumpur. Therefore even if the bus fare of RM 48.00 for bus from KLIA/KLIA2 to Sitiawan is higher than total bus fare of KLIA/KLIA2 to KL and KL to Sitiawan, it does not stop locals and foreign tourists from taking this convenient and direct bus service from KLIA/KLIA2 to Sitiawan. 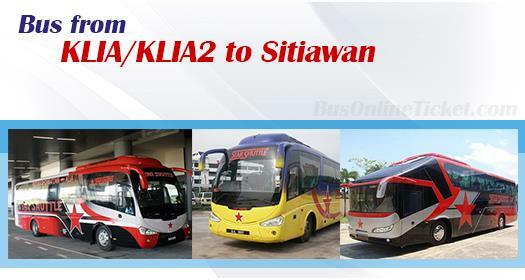 Star Shuttle has started providing returned bus service between KLIA/KLIA2 and Sitiawan since 10 years ago. They have a strong and experienced team in the operation to ensure passengers’ smooth journey between KLIA/KLIA2 and Sitiawan. Due to limited daily trips and Star Shuttle being the sole provider for bus from KLIA/KLIA2 to Sitiawan, passengers should always book their tickets online in advance at BusOnlineTicket.com to avoid a long waiting time at the airport. BusOnlineTicket.com accepts foreign credit card, Internet banking, and Paypal payment options which makes online booking easier for foreign tourists coming to Sitiawan and Lumut.